My working exclusively in ink has continued through this month, though there was less of it than in June. As I covered in this blog, it was a very busy month, but I did make a little time for drawing. I'd been working on faces since March, and about halfway through June I decided I was ready enough to move on to bodies. 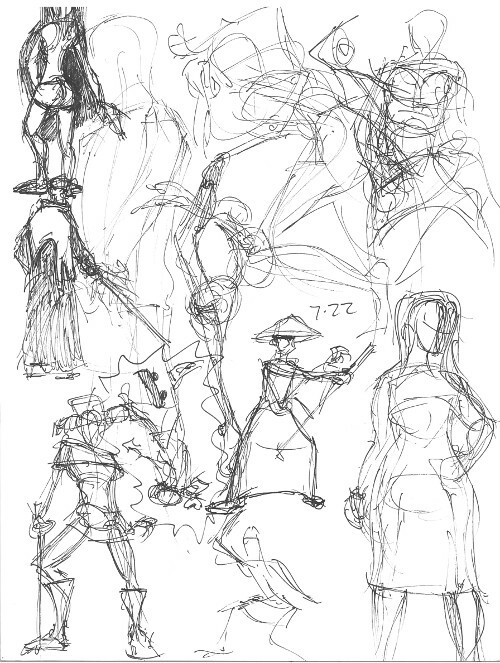 While the occasional no-too-horrible doodle would spring onto the page from my imagination, what you'll see below is mostly stiff and disproportionate. I don't know why it took me so long before I looked into sketching from references, but I finally did about three weeks into July. I spent just a couple of nights on Quickposes.com, and my suspicions were confirmed - there is much to learn about drawing a body from... looking at an actual human body. I think I might have believed it would be less satisfying to draw something that wasn't completely conjured from my own head. But... my head is not full of the accurate details of anatomy and perspective. That's something I have to learn. 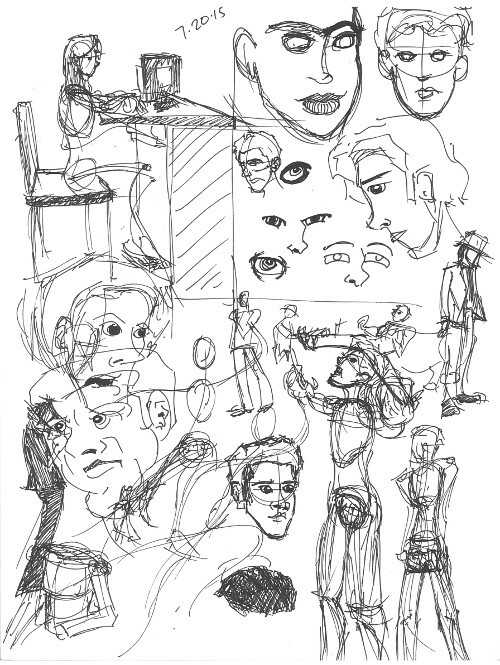 And I learn so much more from quickly scribbling random gestures for twenty minutes than I did when spending hours filling just a page or two with whatever I could wring out of my imagination. Instead of losing the initial impression the more I realize it on the page, I'm able to look back at the photos and see where I went wrong. It's really a no-brainer, and I'm glad I finally got there. But... until we get to those pages, it's going to be mostly bad ones. Check them out and cringe with me. 07.05.15 - Okay, Reclining Guy on the Phone isn't awful. Standing on One Foot with a Spear for Support Guy seems roughly equivalent to a humanoid. The guy on the left wasn't hanging a picture when I started, but I decided that was the least ridiculous explanation for his awkward pose. There in the middle - a pretty fluid gesture. His left arm appears to need serious medical attention, but at least there's movement to it. On the next page, I made my first attempt and understanding a vanishing point. Two vanishing points, apparently. It's a weird shot. 07.06.15 - A work doodle - dramatic actor, likely in the middle of a soliloquy. There's life enough in him, though it is clear I have not studied the anatomy books I bought months ago. 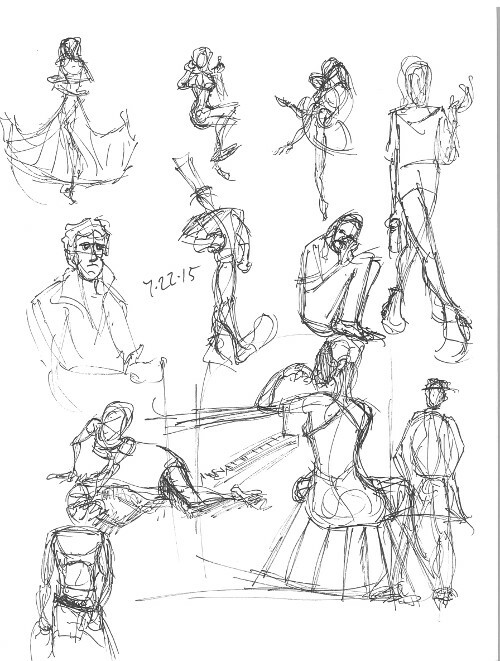 07.11.15 - Made my second attempt at life drawing (the first being on 6-24-15 at the airport). This is the perspective from my bedroom window. That car was actually a truck, but I cant draw yet. 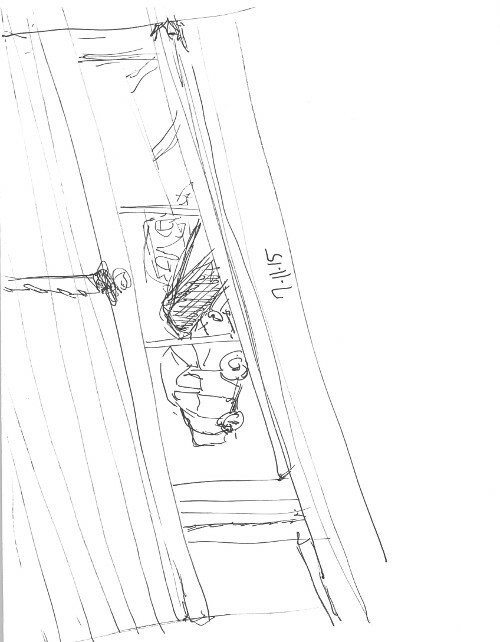 Then I drew my first perspective shot (if you don't count the horizon line experiment... which I don't). This guy walking might have some sort of spine condition, but I was happy enough with the buildings and perspective stuff. Not terrible for a first try, right? I also doodled a cat. 07.13.15 - The only thing worth mentioning here is the fellow jogging in the rain. He looks like he's got a pretty prancey step, but I think the image is clear enough. Guy throwing his hood up and jogging out of the rain. We all get that, right? 07.20.15 - I guess this was the last day I needed without reference to be convinced that... well, I needed to start looking at references. Lots of throwaway pages here just seeing if my pens work. 7.22.15 - 7.28.15 - GLORIOUS! I mean... comparatively speaking. I love Quickposes. I just set the timer to show me a new pose every ninety seconds, and scramble to capture it. The top right of this first page was my first four or five attempts. Just scribbles with no form. But it didn't take me long to start putting my lines to good use. Still not great, but much nicer to look at than "Guy I Didn't Realize Was Going to be Hanging a Picture".